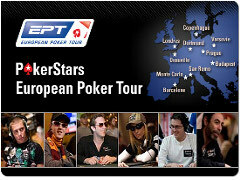 It’s hard to imagine that the PokerStars European Poker Tour (EPT) is entering its 8th Season, but this is in fact the case, and PokerStars unveiled the first half of the Season 8 schedule on their EPT homepage on Friday. Once again the EPT will invade the major cities, and vacation hotspots, all around Europe, as well as their annual excursion to the Bahamas for the biggest tournament that doesn’t occur in Las Vegas, the PokerStars PCA. Stay tuned for the announcement of the second half of Season 8 of the EPT, which should be coming in the near future. This entry was posted on Sunday, June 12th, 2011 at 9:23 am and is filed under Poker News. You can follow any responses to this entry through the RSS 2.0 feed. You can leave a response, or trackback from your own site.